Rousse is the latest addition to the export line from Serge Lutens. 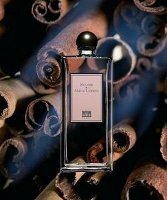 It was created by perfumer Chris Sheldrake, and the notes are mandarin, cinnamon, cloves, spices, floral & aromatic notes, fruit, cinnamon wood, precious woods, amber, musk and vanilla. Early reports that Rousse was based on cinnamon and inspired by Serge Lutens' memories of his grandmother "baking and making jam" (via osmoz) suggested that it might turn out to be a spicy gourmand, but it is no such thing, in fact, it is less foody than Cèdre (spiced apple cider) or the many from the line that start with heavy doses of stewed spiced fruits (Chypre Rouge, Santal Blanc). To be sure, cinnamon is the star of the show here. The opening is lively and sweet, and reminiscent of cinnamon Red Hots (and if you like Red Hots, see also Comme des Garçons Harissa). The dry down is much drier and milder, and the cinnamon takes on first a dusty, later a creamy-powdery quality as it blends with dark woods, iris and whatever else is in there (the fruits and flowers are indistinct). There is a touch of amber and vanilla to keep it from being quite bone dry, and like yesterday's Mandarine Mandarin, it has a kind of murky-dusky, not-quite-dark-not-quite-bright quality. I wouldn't call it a transparent scent, but it is considerably less embellished than the "standard" Serge Lutens style, if such a thing exists. I would call it spare, even restrained, and it will not, like some in the line, continue to morph on your skin over a period of hours. Many reviewers so far seem to find it dull, but I have liked it more and more on each wearing — I like spare and restrained — and it is easily my favorite of the recent Serge Lutens releases. It is entirely unisex, and while it is not heavy, the spicy warmth is probably more suited to fall/winter than spring/summer. Rousse is available in 50 ml Eau de Parfum; for buying information, see the listing for Serge Lutens under Perfume Houses. I love Rousse and invested in a bottle. It reminds me of an orange pomander, which makes me think of Xmas, which makes me wonder why on earth they released it in the spring. Oh well, I love it either way. It's SL's most straightforward, “Okay, people, I think it's clear that I love spices” scent. It's like he went for years hinting at it by tucking spices here (under some cedar) and there (between some petals), and finally decided to give 'em to us straight up, three fingers, no ice or olive, just a little orange peel. Thanks Serge. I like it, too. There is a buttery quality to it that off-sets the dryness. Certainly you would be disappointed if you were set on the baroque Serge style that exagerrates the hidden facets of a note, but there is virtue in simplicity, too. Some seem to find it too sweet, but I'm usually sensitive to high carb content and Rousse didn't bother me. K, the timing seems odd to me too — it is almost like an early winter comfort scent. I definitely love this one head and shoulders above MM or Chypre Rouge or most of the other things they've done lately. Adore this scent. I suffered a deep, dark night of the soul crisis of faith due to Chypre Rouge and Gris Clair and, although I loved Mandarine Mandarin, as I said yesterday, it eventually seemed too similar to FdO for me to need. I think my faith might have been irrevocably shattered had it not been for Rousse. Forgive me Serge for having doubted. It must be wonderful! I love cinnamon, to smell and to eat also. Great review! I just feel really sad when you write about a perfume that's impossible to find here in Brazil. Hugs! Sister Y — it's so funny you say that, because when I first tried it I realized that Rousse smells to me like a more delicate version of original CdG. I gave away my bottle because it was just too strong for me. With Rousse, I get the same effect but softened. Sigh, I so wanted to fall in love with it. I like Sheldrake's take on simplicity in Fleur de Citronnier and Clair de Musc, but Rousse was like a diluted version of his previous attempts with Les Eaux Boisees. I found it to be pretty, but not particularly memorable. It is comforting, M. They should have released it in early fall, I think it would have found a bigger audience. Cracking up at “deep, dark night of the soul crisis of faith” — we are so dependent on a few consistently interesting brands, aren't we? Oh dear, is there no Serge Lutens in Brazil at all, anywhere? Well, I've been making very good use of my bottle in the unseasonably warm sunny weather we've been having here and it works surprisingly well, perhaps because of the dusty, waxy quality the scent has. I love it. As Marina says, it's comfort in capitals and underlined, with some sparkling lights flashing on and off around the word. I'm so glad it grew on her. MM, unfortunately, I disliked more each time I wore it, although I don't exactly hate it even then — it just does nothing for me. Rousse has grown on me though! Not a single bottle to buy! I'm very curious about this brand, as I was with Frederic Malle. They sent me samples and now I'm dying to buy En passant and L'eau d'hiver (very kind). Two of my favorite FMs, lucky you! They won't even mail you samples if you live anywhere near a store, even if it is 2 cities away. But sorry you can't easily buy either brand! My grandmother always made jam, too. She did this in the summer when the berries are ripe. Maybe it reminds him of summer. Good a guess as any! For the last two days I have been trying Un Bois Vanille. I'm surprised this has not been reviewed. This is not your common vanilla fragrance. I do smell the vanilla but there is also some spice in it. I smell the almond and musk but I also smell verbena. Oooo…want it, want it, want it. “Chypre rouge” did some strange things to my psyche–and with names like “Clear Gray” and “Datura Noir”…I can't help but imagine some hoodo-voodo passing through Serge's veins. Though somewhat one-dimensional, this is a lovely warm scent. To add depth to it, try this: layer Rousse over Carlos Santana for Men. It amplifies Santana's spicy notes, while the Santana gives it depth. And if you're really feeling puckish, try layering Diptyque's l'Autre over Serge Lutens' Arabie. The Arabie adds a golden note to the Diptyque, while l'Autre amps up the spices. Wow, very late reply, I missed this comment! Anyway, hope you've tried Rousse by now! Very unusual layering ideas, thanks! There are other SL fragrances that are more complex and slowly revealing but say what you will this ALWAYS compels inquiries and positive comments whenever I wear it. And, I just find myself in a better mood. Catching a whiff of myself during the day makes me feel protected, comforted, safe, beautiful and in some odd way – generous. I am a girl who favors spirals, unexpected routes, complicated paths and twits but can’t deny that there is something to be said for an unapologetic straightforward “this is what I am” narrative.